Written by Jennifer Walden, images courtesy of Netflix. Please note: Contains spoilers. In Netflix’s film Bird Box, a mysterious entity has plunged the world into an apocalyptic state. Although no one is sure what it is, there is one certainty — if you look at it, you die. Sane survivors no longer venture outside without wearing a blindfold. 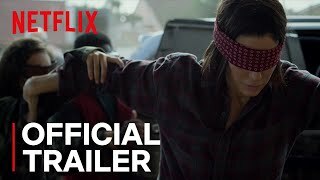 The story follows Malorie (Sandra Bullock) and a crew of survivors who find themselves in the precarious situation of trying to scavenge for supplies while blindfolded all while avoiding a supernatural creature that’s trying to destroy them by making them commit suicide. Plus, there are crazy survivors walking around not blindfolded, who also pose a threat. Malorie and her two children seek refuge at a camp of survivors but to get there, they must navigate down river through dangerous rapids and then trek through an unfamiliar forest… all while blindfolded, of course. Supervising sound editors/sound designers Glenn Freemantle and Ben Barker of Sound24 (based at Pinewood Studios) worked with Director Susanne Bier to create the sound for a creature that is never seen. They also craft a chaotic apocalypse scenario that mixes supernatural elements with organic sounds, and help to heighten the feeling of confusion for the blindfolded characters through a creative approach to mixing and panning. How did you prepare for work on Bird Box? What were some of your initial ideas for how this film could sound? Glenn Freemantle (GF): Our prep work on Bird Box was challenging but very exciting. How do we create a soundscape of an unseen monster in a post apocalyptic world?! Our initial ideas involved working with fear and tension — what sounds could we create that weren’t over processed or too other worldly? How could we imply that fear is all around us without being too sci-fi? As crazy as it sounds we had to think of what would this really actually sound like! How did you approach the sound of the unseen ‘monster’ in the film? Did filmmaker Susanne Bier have a specific ideas or references for how she’d like it to sound? How did you collaborate to find the sound of this supernatural entity? GF: The sound of the unseen monster was a constantly evolving process. We worked very closely with Susanne Bier and Ben Lester (Editor) to land on a series of designed sounds that would play in a number of scenarios, which could build into climatic scenes as well as support the quieter moments. We worked on various layers of the creature, the first being whispers. This was the main way victims were convinced to commit suicide. They could communicate with their victims by getting into their heads and convincing them to take their own lives. The next layer of design was the movement of the creature. We needed to feel that they were moving around us, like a constant threat that was surrounding us. We used swarms of bees as our core sound to do this, which was very effective. Finally, we decided on the idea that the creature would have an “attack” element, something that would be used in the bigger scenes to work as a sonic cinematic tool to tighten tension. As far as references go, Susanne wanted us to start from scratch, to design something original which was great fun for us! What was your process for creating the windy-whispery sound that indicates its presence? GF: Our process involved recording a lot of whispers! When we were recording the loop group we played them the gusts of wind we had laid as part of the design. The idea was that the whispers could be in time and flow together to heighten the creepiness as well as support the feeling that we are surrounded by this presence at all times. Susanne was interested in giving each moment its individual detail, no matter how small. After that we put them into a sampler with a few other design elements to create the weird-whispery sounds you hear throughout the movie. Each time we tried to use specific phrases, which would relate to that particular scene. Susanne was interested in giving each moment its individual detail, no matter how small. Since the characters are blindfolded, they rely on sound to determine what’s going on around them. What were some of the challenges/opportunities you had while creating these blind-fold scenes? Taking out all the surrounding atmosphere and concentrating on the breathing and spot sounds helped us to create the confusion of the space she’s in. GF: The blindfold scenes presented us with some fantastic sonic opportunities. It really allowed us to go inside the character’s head. To do this, we used both sides of the shot to help us to feel the jeopardy the character was in when blindfolded. Increasing the natural surroundings on the exterior before we went to the POV allowed us to really immerse ourselves into Malorie’s perspective. Taking out all the surrounding atmosphere and concentrating on the breathing and spot sounds helped us to create the confusion of the space she’s in. We also played with levels and panning, which added to what we were watching on-screen. We hear a sound but where did it come from and how far away is it? Can you talk about creating the sound for the scene inside the car when the group is on their way to the grocery store? GF: The car scene was our first real physical contact with the monster, which was pivotal for the audience. Before that, the encounters had just been its presence. The characters had only felt what was going on around them, but this was its first connection. To do this, we had to continue the monsters sound language from previous encounters and then progress it into a scary crescendo. Using our base elements, we progressed the scene by layering human and animal sounds to really punctuate the horrifying situation that was going on outside the car. How about the sound for the rapids scene on the river? GF: The river and rapids was a really great sequence to work on. Here we were back to using natural elements to create our tension instead of the supernatural. We had to enforce the idea that Malorie was taking on this fierce river with Girl (Vivien Lyra Blair) and Boy (Julian Edwards) in a small tin boat. It was a very dangerous situation, especially whilst they were blindfolded. We worked with all organic sounds to do this, which was a great moment to step back from the ethereal world we were set in. And of course their final trek through the woods on the way to the School for the Blind. That was a really intense sequence. What went into the sound work there? GF: The final trek through the woods to the school was approached in three separate sections designed to come together sonically for one complete end sequence. The sound at the start was intended to create complete confusion for Malorie. We had to be sure when she was blindfolded that we had no sense of how far away she was from anything — is it next to me, or over there? Where did the sound come from? As mentioned, the panning and levels of design here really came into effect. Constantly moving design and dialogue went into the sound, again to confuse Malorie and the audience. From there, the creature went into full attack in the final chase leading up to the door of the School for the Blind, which is where we entered the final part to our sequence. Working with the score, it was very important to feel every emotion of Malorie’s pain and emotion, to be close with her horrifying situation as she pleads, “Just take the children.” Working closely with the actors, we played their screams and crying which took over from the creatures around them to push everything into this emotional, terrifying climatic moment. What was your favorite scene in terms of sound? What went into it? We moved from the real to the surreal of the creature attacking whilst working in concert with the fantastic score from Trent Reznor and Atticus Ross. GF: There were a lot of scenes that we really enjoyed in terms of sound, as each situation within the story line brought its own challenge. Having talked about the car, the rapids, and the end sequence, I’d have to say the opening from when Malorie leaves the hospital. It’s such a great sequence. The world is plunging into the darkness but everyone is in such a confused state. We moved from the real to the surreal of the creature attacking whilst working in concert with the fantastic score from Trent Reznor and Atticus Ross. When the cast reach the safety of the house you really do find yourself able to breathe again. It was a great scene to really build the sound throughout. Did you do any fun field recordings for this film? If so, how were those sounds used in the design? GF: We got out to record some forest and rapids. It was important to us to have completely organic sounds when we could in a film, which was heavily designed around fiction. Sound-wise, what are you most proud of on Bird Box? GF: I think the film as a whole to be honest. It was such an exciting project to be a part of. We were given such a fantastic creative director in Susanne, who encourages the use of sound design. I have to say we’re proud of it all. A big thanks to Glenn Freemantle for giving us a look at the quietly intense sound of Bird Box – and to Jennifer Walden for the interview!